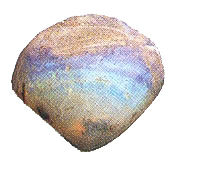 Opal is a hydrous silicon dioxide with a harness of 5.5 – 6.5 and grouped into three categories. Precious opal, fire opal and common opal. Precious opal ranges from transparent to translucent and has a rainbow like iridescence that changes as we look it from different angles. Observations with an electron microscope revealed that opal is a very orderly structure of tiny spheres of the mineral cristobalite, layered in siliceous ‘jelly’. The distance between these spheres is approximately the same length as the wavelength of light, so that diffraction occurs when the light hits the stone, causing the iridescence. Opal, with its expanding intensity, encourages both freedom and independence. It is also good stone for expanding creativity. Another important factor is opal releases anger and claim self-worth.